Posted by GuySoft in Electronics, open source, python. So I’ve been cooking sous vide a few months now, with a sous vide I built myself. Its connected to a RaspberryPi and can be controlled via the web or telegram. Flash a ready made image to the Pi! 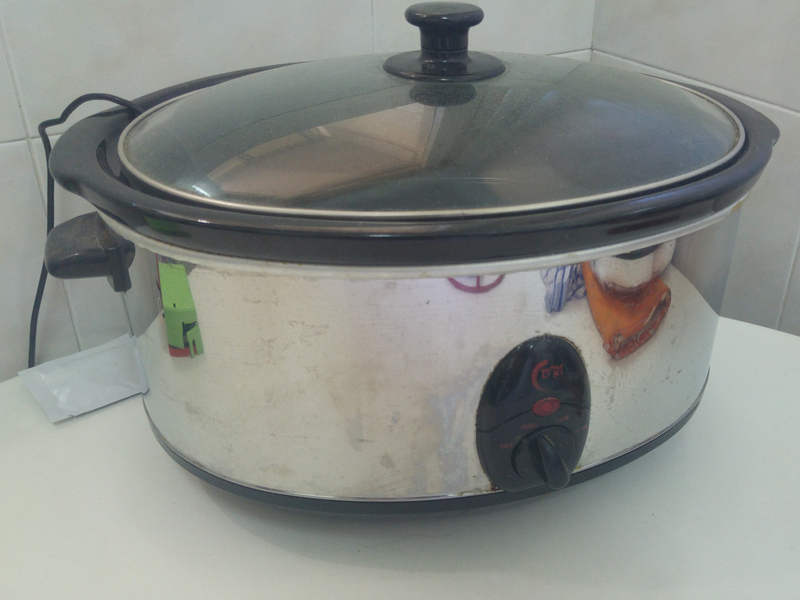 Slow cooker (crockpot) with a ‘high’ option. You can get them second hand, they are pretty cheap. Make sure it has no digital control. Raspberry Pi, even version 1 should work – also an SD card and power supply for the Pi. Pi Plate prototype board. Make sure you get one that matches your Raspberry Pi footprint if you are re-using an old Pi. Power socket and power connector for your country – get locally so it fits your country standard. Water resistant temperature sensor DS1820 x2 – Get a spare one so you can measure the temperature difference and make sure your sous vide is uniformly heated. Important – 3D printed enclosure for raspberrypi (Raspberry Pi 1) and enclosure for the relay – you are mixing water and electricity in a kitchen, don’t be an idiot.